We have a size to fit your specific storage needs. Feeling cramped for space? Are you in need of self storage units, boat storage or RV storage? Then, you've come to the right place! 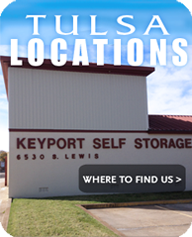 Keyport Self-Storage of Fayetteville, Arkansas has been serving customers for over 35 years. In 1976, we recognized a need for more public storage options; and the opportunity to meet that need allowed our family-based company to expand to three states. Aside from Fayetteville, Arkansas, we serve the Tulsa Metropolitan area with five facilities; we, also, have one location in Broken Arrow, Oklahoma and an additional facility in Sherman, Texas. Over the years, we have developed a reputation of trustworthiness, dependability and customer satisfaction. Our family, very much, understands the rigors and stressors associated with moving. Our goal is to make your transition as smooth as possible by providing a needed and convenient service at a very fair price, coupled with a wide variety of accommodations that can help make your family's move as hassle-free as possible. Our Fayetteville location can serve just about any individual or family storage need. If you require only a compact, closet-sized area of 25 square feet to store small furnishings or portable appliances, look no further; we have what you need. For those much larger demands, we provide spacious rooms that are the equivalent of a three and a half car garage, or 450 square feet, that will easily store large furniture and appliances. Whether your situation requires a small, medium or large space, we have your place! 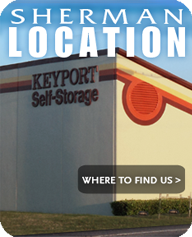 Keyport Self-Storage, also, offers a "Unit-Size Estimator" which allows you to accurately determine which of our most-commonly used units will provide the most useable space at the most affordable rate. We offer extra amenities which are designed to provide a secure, safe environment, in addition to meeting our customers' personal and business needs. These amenities include: ** Computerized entry ** Month to month leasing ** Commercial deliveries accepted ** RV and boat spaces available ** Half off first month's rent on selected units or.....Pay for 12 months, on any unit, and get the 12th month free! Our home-based company takes great pride in our A+ affiliation with the Better Business Bureau; and our customers who have come to trust and appreciate our long-held commitment to excellence, have remained an integral contribution to our perfect standing with the BBB. We, also, maintain our on-going membership with the Arkansas Self-Storage Association to stay continuously aware of how we can best serve the needs of our clientele and our community. To further serve you, we are conveniently open 7 days a week: Monday - Saturday 9 am to 6 pm Sunday - 1 pm to 6 pm Our family would love to meet yours; and, remember: If you need some space, we have your place! Contact us today! Keyport Self Storage is your best choice for self storage in the Fayetteville area. We also have mini storage facilities in Sherman, Texas and Tulsa, Oklahoma.